The shop is owned by Rebecca Ryther, a professionally trained make-up artist with many years freelance experience in the fashion, beauty, editorial, commercial, catwalk and bridal industries. 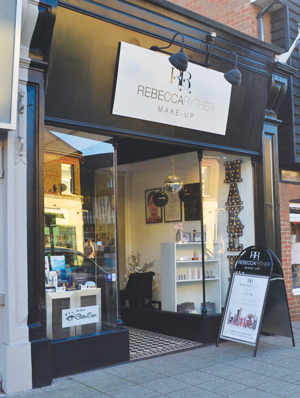 Rebecca brings her industry experience to this independent make-up shop which retails luxury, high-end cosmetics from professional brands together with a ‘make-up bar’ where you can have your make-up done for any special occasion. Independent advice is always on hand from a make-up artist to assist you with the purchase of any products or for general advice and help with any make-up questions you may have. At the make-up bar we offer a variety of make-up services, all applied by experienced, trained make-up artists. We do make-up for our clients for a number of special occasions including birthdays, parties, anniversaries, balls, dinner-dances, hen-nights, themed parties, fancy-dress, wedding guests, christening guests etc. We also offer Wedding and Prom make-up based at the shop only (not a mobile service). Please see the services page for further information. The make-up bar also offers relaxed and informative make-up lessons, tailored to your individual requirements. Please note: Rebecca is no longer a mobile make-up artist. Her make-up appointments are all carried out at the shop. She does offer wedding and prom make-up at the shop, if this suits your arrangments.